[b]Dozens of ski areas in the US Midwest have been forced to close due to extremely low temperatures currently prevalent in the region. A weather phenomenon known as the Polar Vortex has been bringing down temperatures as low as -40F from the Arctic, which with added wind chill can bring temperatures as low as -50F. More snow for The Alps, The Pyrenees, Bulgaria and also the Dolomites this week; still cold in the US and heavy snow for Japan. A study of car hire costs this February half term at 'ski hub airports' carried out for a company hoping to encourage people to use its idea to reduce those costs has put some numbers to what are generally well-known facts; firstly that some parts of Europe are more expensive than others, second that all the extras added on at the rental desk can more than double the initially quoted price of a rental. Ski areas in Scotland are increasingly optimistic of having some non-beginner-only terrain open this weekend, some have already open ski runs. The five highland areas have had a very challenging start to the 2018 season with very little natural snowfall until the past few weeks and warm temperatures often wiping out any cover that started to build. Downhill ski racer Aksel Lund Svindal has announced he will aim to compete in the Downhill and Super G competitions at the Alpine World Championships in Åre, Sweden, next week before retiring. The Norwegian, who turned 36 last month, is one of the most successful ski racers of all-time, but has been suffering from a knee injury and pulled out of both the Downhill and Super G races in the Hahnenkamm at Kitzbuhel last weekend, and won't race at Garmisch next weekend. It has been snowing heavily in the Alps over the weekend and continues to snow in the Pyrenees, where conditions have been transformed over the past week after a two month, mostly-dry, spell. This time it is the Western Alps and France and Western Switzerland that is seeing the biggest snowfalls, with one area reporting 70cm in the past 24 hours and many at least 30cm. Vail Resorts' have announced plans to spend $175m on upgrades to their 18 resorts ahead of the 2019/20 ski season. The company now owns many of the leading resorts in North America including four of the five largest by skiable area Whistler Blackcomb, Park City, Heavenly and Vail itself as well as famous resorts like Stowe, Beckenridge and Crested Butte and Australia's largest resort Perisher. Great Britain has announced their squad for the upcoming Alpine Skiing Championships which will take place in Are, Sweden between 4 and 17 February next month. The Championships take place biannually in non-Winter Olympic years. Three-time Olympian Dave Ryding heads up the squad which is competing between 4 and 17 February and is targeting Britain's first Alpine World Championships medal in 83 years after taking silver in a World Cup Sprint race at New year, his career second and a British record. The Pic du Midi, French Pyrenees, just before the snow came! Fresh snow for The Pyrenees and Bulgaria this week, cold in the US and more settled conditions elsewhere. The long-awaited 'proper' start to the Scottish ski season (after a warm and mostly dry autumn and early winter) seems to be gathering momentum with the two West Coast ski areas of Glencoe and Nevis Range opening several full runs each following fresh snowfall and low temperatures for snowmaking over the past week. The Compagnie des Alpes, reputed to be the world's biggest ski resort operating company, said its overall sales were up 16.6% to ?54.6 M from ?46.8 M for the start of the ski season compared to the same period last year. Income for lift pass sales from the French company which runs most of the world's biggest ski regions also rose by +16.6% compared with the 1st quarter of the previous year. Snow is falling again in the Pyrenees after a largely dry December and first-half of January. J2Ski is currently forecasting snow to continue all week with the heaviest falls likely from tomorrow Tuesday to Thursday. Some areas may see almost a metre of snowfall over the coming week. Breckenridge will be staying open for snowsports more than a month longer than expected, to the end of May, from this year onwards, it has been announced. The famous US resort, which has one of the world's highest ski areas and the planet's highest quad chairlift, was due to close as usual in late April, but will now stay open to the US Memorial Day holiday weekend, this year ending on Monday 27th May. The high court in Bulgaria has called a halt to plans to almost quadruple the size of Bulgaria's famous Bansko ski area. In the latest stage in a succession of legal rulings and government decisions over the past 18 years, Bulgarian Courts ruled that the plans broke Bulgaria's laws which say it is illegal to build in national park land. There have been huge snowfalls on the mountains of California after a major storm hit the Pacific Coast. The snow was accompanied by strong winds that at time reached 100mph, leading government agencies to advise people to stay indoor at times. Some massive snowfall, followed by clearing weather in The Alps this week. The world's deepest snow depth reported by a ski area has reached 6 metres or 20 feet on higher slopes at the Swiss resort of Andermatt Sedrun-Disentis. It's less than a week since the resort became the first to report a snow depth of 5 metres, again the first in the world to do so, but it has had more than a metre of snowfall in the interim, the latest 35cm in the past 24 hours. Following both large accumulations of snow in the Northern Austrian Alps and a change of weather in the French Alps, Henry Schniewind from snow safety company HAT (Henry's Avalanche Talk) explains the current situation for anyone considering skiing or snowboarding off-piste during the next week. With the latest fall of heavy snow starting to hit the Alps with several areas forecast to potentially get another metre of snow by Monday evening, it seems time to stop reporting on when it is going to snow heavily, and start reporting on when it isn't going to snow heavily, as the latter is the rarity in January 2019 in the Eastern Alps it seems. Snow has begun falling again in the Pyrenees after more than a month without snow. So far the biggest accumulations have been on the French side of the southern mountain range with Les Angles (pictured above today) issuing a powder alarm for an average 25cm of fresh snow overnight and says more than 30cm of snow fell on upper slopes. Huge snows for Austria, and snow moving into France now too. The avalanche danger level has been placed at the highest level in the Alps for what's believed to be a year after sustained heavy snowfall in parts of Austria reached more than 3 metres (10 feet) over the past week in places and was accompanied by windspeeds of up to 100kph at times. Another 1 to 1.5 metres of snow is expected over the next few days at some areas. "The goal of the initiative is to raise awareness about CO2 emissions and get as many people as possible to travel by train," said a resort spokesperson. After a largely snowless Christmas and New Year in the Western Alps, snow is expected to start falling tomorrow in France and Western Switzerland. Although most of the major ski resorts in the region have had a good start to the season thanks to big snowfalls building bases in November and the first half of December, the lack of fresh snowfall in the West has been made more noticeable by the very heavy snowfalls further East over the past few weeks. The exceptional ongoing snowfall in the Eastern Alps is causing some logistical issues in some parts as the snow leads to precautionary overnight road closures. Airports in Western Austria including Innsbruck have also had periods of closure with flights diverted and some ski areas have had to limit operations or in some cases temporarily close entirely due to the volumes of snow and cold weathers. Snow is continuing to fall heavily across much of the country with some of the biggest accumulations in the last 24 hours ? St Anton posted 60cm (two feet) since yesterday. 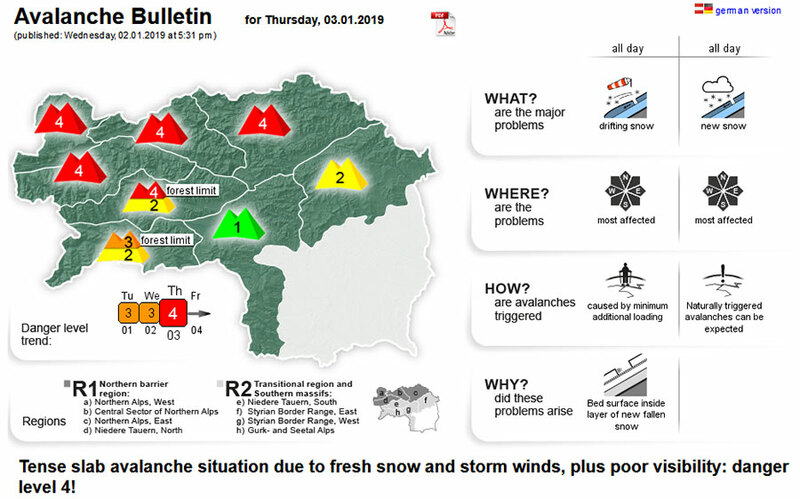 Heavy Snow means Avalanche Risk 4 (High), across much of Austria, including Steiermark today - see the full Avalanche Bulletin for more info. Britain's Dave Ryding has become the first British man to win two silver medals at World Cup level in the Alpine Skiing World Cup after taking the runner's up spot in the World Cup Parallel Slalom competition in Oslo this afternoon. Ryding narrowly lost in the final of the head-to-head style slalom competition which was staged on the run-in slope of the famous Holmenkollen ski jump at the Norwegian capital.